The first word for this month is Mars, suggested by Kate on Patreon. This is a happy coincidence, given the recent successful landing of the InSight Mars Lander. These are stitch patterns such as might be found in a stitch dictionary. They are not patterns for finished object.s You will need to add selvedges or some other form of knitted stitches to either side. 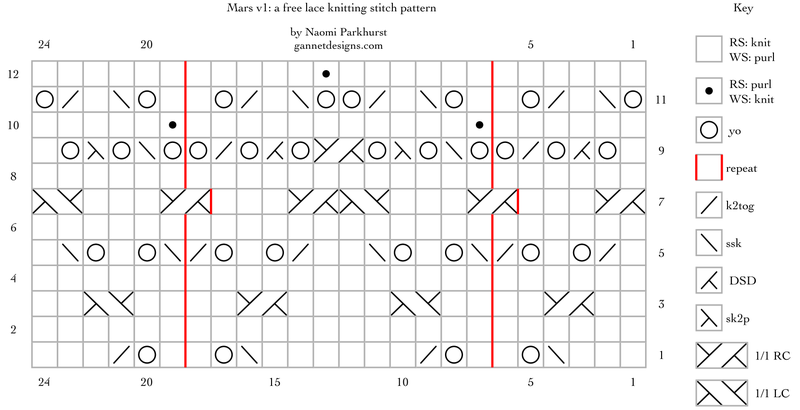 Version 1 of Mars is a multiple of 24 stitches and 12 rows; version 2 is a multiple of 24+24 stitches and 24 rows. Aside from the extra rows in version 2 (rows 1-12 offset halfway), the decreases are slightly different between the first rows of each version. Version 1 is at the bottom of the swatch shown in the photo. Row 3: k2, 1/1 RC, k2, *k2, 1/1 LC, k4, 1/1 RC, k2; work from *, k2, 1/1 LC, k2. Row 5: k1, k2tog, yo, k1, yo, k2tog, *ssk, yo, k1, yo, ssk, k2, k2tog, yo, k1, yo, k2tog; work from *, ssk, yo, k1, yo, ssk, k1. Row 7: 1/1 RC, k3, *1/1 RC, k3, 1/1 LC, 1/1 RC, k3; work from *, 1/1 RC, k3, 1/1 LC. Row 9: k1, yo, DSD, yo, k2tog, *yo x 2, ssk, yo, sk2p, yo, 1/1 RC, yo, DSD, yo, k2tog; work from *, yo x 2, ssk, yo, sk2p, yo, k1. Row 10: p5, (k1, p1) in double yo, *p10, (k1, p1) in double yo; work from *, p5. Row 11: yo, ssk, k1, k2tog, yo, k1, *k1, yo, ssk, k1, k2tog, yo x 2, ssk, k1, k2tog, yo, k1; work from *, k1, yo, ssk, k1, k2tog, yo. Row 12: p6, *p5, (k1, p1) in double yo, p5; work from *, p6. Version 2 is at the top of the swatch shown in the photo. Row 3: k2, 1/1 LC, k2, *k2, 1/1 RC, k4, 1/1 LC, k2; work from *, k2, 1/1 RC, k2. Row 5: ssk, yo, k1, yo, ssk, k1, *k1, k2tog, yo, k1, yo, k2tog, ssk, yo, k1, yo, ssk, k1; work from *, k1, k2tog, yo, k1, yo, k2tog. Row 7: k4, 1/1 LC, *(1/1 RC, k3) x 2, 1/1 LC; work from *, 1/1 RC, k4. Row 9: yo, ssk, yo, sk2p, yo, k1, *k1, yo, DSD, yo, k2tog, yo x 2, ssk, yo, sk2p, yo, k1; work from *, k1, yo, DSD, yo, k2tog, yo. Row 10: p6, *p5, (k1, p1) in double yo, p5; work from *, p6. Row 11: k1, yo, ssk, k1, k2tog, *yo x 2, ssk, k1, k2tog, yo, k2, yo, ssk, k1, k2tog; work from *, yo x 2, ssk, k1, k2tog, yo, k1. Row 12: p5, (k1, p1) in double yo, *p10, (k1, p1) in double yo; work from *, p5. Row 13: k3, k2tog, yo, k1, * k1, yo, ssk, k6, k2tog, yo, k1; work from *, k1, yo, ssk, k3. Row 15: k2, 1/1 RC, k2, *k2, 1/1 LC, k4, 1/1 RC, k2; work from *, k2, 1/1 LC, k2. Row 17: k1, k2tog, yo, k1, yo, k2tog, *ssk, yo, k1, yo, ssk, k2, k2tog, yo, k1, yo, k2tog; work from *, ssk, yo, k1, yo, ssk, k1. Row 19: 1/1 RC, k3, *1/1 RC, k3, 1/1 LC, 1/1 RC, k3; work from *, 1/1 RC, k3, 1/1 LC. Row 21: k1, yo, DSD, yo, k2tog, *yo x 2, ssk, yo, sk2p, yo, 1/1 LC, yo, DSD, yo, k2tog; work from *, yo x 2, ssk, yo, sk2p, yo, k1. 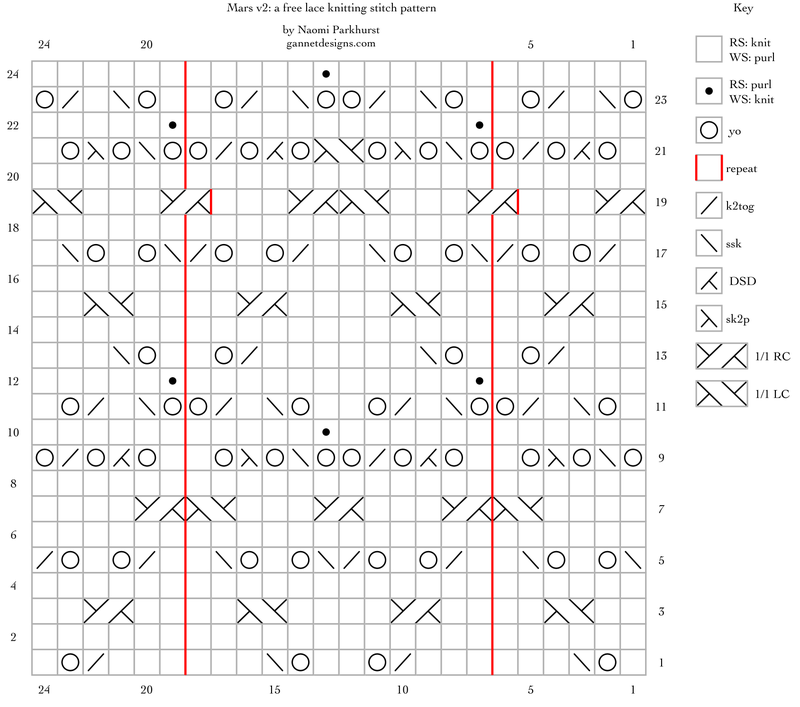 Row 22: p5, (k1, p1) in double yo, *p10, (k1, p1) in double yo; work from *, p5. Row 23: yo, ssk, k1, k2tog, yo, k1, *k1, yo, ssk, k1, k2tog, yo x 2, ssk, k1, k2tog, yo, k1; work from *, k1, yo, ssk, k1, k2tog, yo. Row 24: p6, *p5, (k1, p1) in double yo, p5; work from *, p6. For some reason, this kind of reminds me of something vaguely gothic, maybe the way some of the YOs come together like eyes and a mouth in a cartoon skull! It’s actually really cool looking and I think it’d make a fun bottom hem on a light spring sweater because it’s lacy but has some substance. Thanks so much for making these! Hm, yes! I’m glad you like it. what a gorgeous stitch pattern. thanks for sharing it!